Do you know what the best use of old bananas is? Banana bread, of course! This recipe uses some whole wheat flour in place of all-purpose flour for extra fiber and walnuts for healthy omega-3 fatty acids. It is perfectly moist and great for breakfast or snacktime! 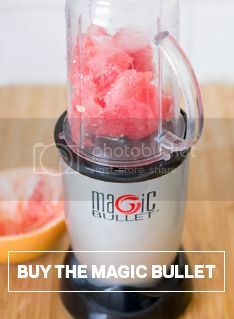 The Magic Bullet makes this recipe quick and easy – just load up the large blender cup with the ingredients and pulse until you get a nice chunky batter. I love banana bread served warm with a glass of milk – yum! In a separate bowl, whisk together flours, baking soda, salt, and cinnamon. Add butter, applesauce (or sour cream), eggs, and vanilla to a Magic Bullet blender cup. Add half of the dry ingredients to the blender cup, cover and pulse. Add the remaining dry ingredients and the milk and pulse until well blended. Mash the bananas in a bowl and gently mix into the batter with a spoon. Grease a 9×5 inch loaf pan and pour in the batter. Bake for 55 minutes, then remove from the oven and cool for 30 minutes. Loosen with a knife and remove from the pan to finish cooling.